Some things in New Orleans seem never to change and that is especially true for Vieux Carré, the French Quarter. Except that some things have changed over the years. The original French colony of La Nouvelle Orleans pretty much burned to the water's edge in the 1700's and was rebuilt by the Spanish governor at the time. Carriage houses and slave quarters are now trendy shops, restaurants, homes and rentals. Recently, New Orleans celebrated, or at least noted the 200 year anniversary of the purchase of Louisiana by Thomas Jefferson from Napoleon Bonaparte. The flags of Spain, France, United States, Confederated States (and again the United States) get all mixed up in history. 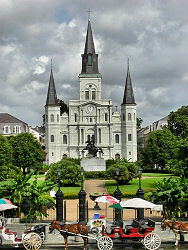 You don't have to know the history of New Orleans, but is sure helps. 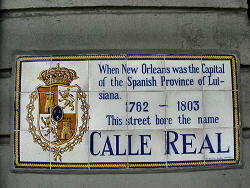 Take for instance the street name in the French Quarter. Most have two names. One you will find on both maps and on lamp posts. The other you will find on building corners, street names left over from the Spanish. Once and for all, both Creole and Cajun have French roots. French Creoles founded New Orleans and Creole cooking and Cajuns (authentic Cajun cooking by the way is nearly impossible to find in New Orleans restaurants) who came later by way of French speaking Nova Scotia (l'Acadie) and settled the outlying Parishes. Read Evangeline, a tale of Acadie‎ by Henry Wadsworth Longfellow.